What’s the first thing that comes to mind when you think of Italy? Is it ancient civilizations and wonders of the world? Bustling metropolises and passionate people? These are all things that Italy is known for, but if you’re like us, your mind skips beyond these signature staples and focuses on one thing—the food. Italy is synonymous with cooking. The techniques, recipes, and dishes born out of Italian kitchens are some of the most popular and influential throughout the world. 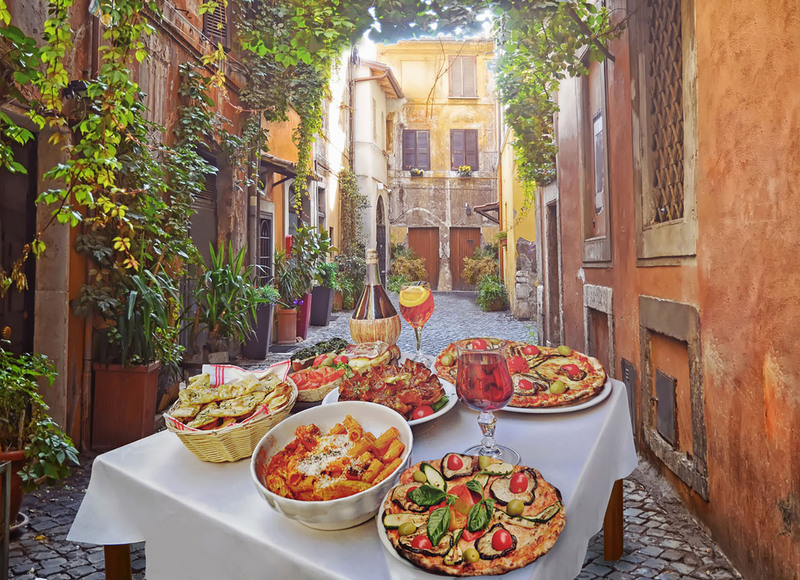 No matter where you call home, odds are there’s an Italian restaurant nearby—though the slices of pizza and sizeable helpings of spaghetti they serve may be very different from what you can expect on your trip to the Bel Paese. Depending on the region of Italy you visit, you’ll sample many dramatically different (and delicious) dishes. Why is that? It has a lot to do with the country’s fascinating history and the proud cultures that flourish in its 20 unique regions. If you have an appetite for learning more, join us for this four-course look at Italian cuisine. Italy is home to more than 2,000 years of culinary history dating back to the Roman Empire. In fact, the Roman cookbook Apicius was compiled in the 1st century and today is believed to be one of the oldest collections of recipes ever discovered. The name of the book was inspired by Marcus Gavius Apicius—perhaps the world’s first foodie—who has long been associated with a love of a good meal. There are some who say he compiled the collection, though no conclusive evidence of this exists. What is indisputable, however, is that the diversity of regional Italian food took off after the fall of the Roman Empire. This massive political and cultural shift in the area gave rise to individual city states, each fostering distinct traditions—including in the ways they would cook and prepare their food. These city states and regions remained mostly autonomous until the late 1800s (well over a millennium) when Italian unification occurred, and the country of Italy was born. That said, even today, it’s common for Italians to proudly declare loyalty to their region—as well as their regional cooking style—before declaring loyalty to their country. Now, this doesn’t mean similarities can’t be found throughout Italian kitchens and dining rooms. No matter the region, you’ll find emphasis placed on fresh, high-quality ingredients. Seasonal vegetables, meats, fish, eggs, and cheese, are hallmarks of dishes across the country. Simplicity is also an essential element of Italian cooking, with most recipes having very few ingredients—all of which are carefully considered. Italy’s not a large country—it runs about the length of California—but the culinary differences between the north and south can sometimes make it feel like you’re dining in two different worlds. Resting in the shadows of the Alps and the Dolomites, Northern Italian meals take a great deal of influence from the European countries it borders. You’ll find notes of French cuisine in this area, as well as influences from Italy’s Swiss and Austrian neighbors. Meat and dairy both factor heavily in Northern Italian dishes, as do rice, corn, and cheeses. The closer you get to the water, the more you’ll notice seafood on the menu. You may be surprised to learn that pasta dishes aren’t as popular up here as they are in the south, but there is a distinct richness to Northern Italian food—highlighted by the butter-based creamy sauces that often top a dish. Risotto, polenta, gnocchi, and stuffed pasta are all northern staples, as are cured meats such as Prosciutto di Parma. Making your way south and deeper into the Mediterranean, you’ll find meals infused with Greek and Moorish influences. Sometimes referred to as Cucina Povera (poor-man’s cooking), Southern Italian dishes are where the elements of simplicity, minimal ingredients, and a touch of creative thinking shine. The naturally warm climate of Southern Italy means ingredients such as peppers, tomatoes, and olives are readily available, and form the basis for many of the South’s iconic culinary exports—including pasta dishes, olive oil, and Neapolitan pizza margherita. You may be surprised to learn that horse meat is considered a delicacy in some parts of Southern Italy, so don’t be shocked when it appears on the menu. Southern Italian dishes also take advantage of bountiful hauls from the Mediterranean. You’ll often see recipes that call for octopus, fresh sardines, anchovies, tuna, and swordfish. When you travel to Italy, join us in the north for tomato tasting in Tuscany, a guided tasting tour through the seaside town of Rapallo that offers a seat at the table where locals love to dine, or a cooking class with the culinary masters of Elba. Then, in the south, uncover the secrets of Sicily’s dishes, perfect pasta making in Alghero, and stroll the fish and fruit markets of Sorrento. Along the way, you might just pick up a few of the secrets to mastering Italian cooking, or, at the very least, a new favorite dish! Across Italy, you’ll find more than 400 different types of cheese, ranging from iconic flavors like mozzarella and parmesan to lesser-known styles like la tur, the hard to come by bettelmatt, and the flavorful weinkase lagrein. Like other Italian foods, cheese varies dramatically by region. At the foot of the Italian Alps in the north, for example, cows graze pastures eating flavor-rich grass, and their milk is used to produce bagòss, fontina, and gorgonzola. It is said that some astute taste testers can tell which type of grass a cow ate—and exactly which pastures they grazed in—before the cheese-making process begins. In the south, the natural landscape is much rockier, making it difficult to raise cattle. Instead, southern farmers began raising sheep and goats (Cucina Povera! ), which produce milk for their cheeses, including pecorino, caprino d’aspromonte, and vastedda della valle del belice. The south is also where mozzarella originates. Tasting true Italian mozzarella, you’ll notice a distinct difference from its North American counterpart, which is typically made with cow’s milk. If sampling the cheeses of Southern Italy is top of your list, join us for wine and cheese at Quattro Passi, a Michelin Restaurant overlooking the waters of Sorrento Bay. While looking at Italian cooking through the lens of northern style or southern style can be helpful, it doesn’t quite capture the diverse nature of the food. Italy is home to 20 unique regions, each of which lends its own flavor to the dishes we know and love. Let’s take a closer look at what to expect from the regions you visit when traveling through Italy with us. West of the Italian peninsula, Sardinia’s limestone cliffs rise high above crystal clear waters. The second largest island in the Mediterranean, Sardinian cuisine has largely been influenced by its history as a safe place to stop on trade routes. Phoenicians, Spaniards, Carthaginians, Arabs, and Romans would frequently dock along the shores of Sardinia, bartering their goods, as well as sharing their gastronomic culture. Because Sardinia is an island, it should come as no surprise that seafood is in favor here. In Cagliari, visit La Scala to sample incredible handmade fregola Sarda—a signature Sardinian pasta topped with seafood sauce. Further northwest in Alghero, lobster is king. Often prepared the Catalan way (a result of Catalonian conquerors visiting the area at the tail end of the Middle Ages), expect your lobster—known as aragosta alla Catalana here, to be boiled with tomatoes and onion, then seasoned with oil, lemon, salt, and pepper. The food of Campania is more commonly known as Neapolitan, and the region is responsible for two of Italy’s most appetizing exports—spaghetti and pizza. You’ll have no trouble finding spaghetti alla Puttanesca—a seafood pasta featuring anchovies, capers, olives, tomatoes, chili peppers, and garlic—in any restaurant, but we recommend Ristorante Pizzeria Il Mulino in Amalfi for a quiet, flavorsome experience. For another Amalfi favorite, make your way to the Marina Grande. Beginning life a seaside bar in 1918, Marina Grande moved to Spiaggia Grande in 1935 and has been serving locally-inspired dishes using ingredients sourced from farmers and fishermen from along the Amalfi coast. Be sure to try their selection of local artisanal cheeses, including caciotta di bufala, a buffalo soft cheese this region is also famous for. This is the type of restaurant where you’ll continue to savor the meal long after the food is finished. If an authentic slice of Neapolitan pizza is a must-try for you, you’ll find it at Pizzeria Da Franco in Sorrento. This restaurant exudes a charming Italian aesthetic—which is wonderful—but what you’re really here for is the pizza. You may have to wait a few minutes as the pizzeria is typically filled with locals, but the wait is certainly worth it. Relatively isolated compared to many other Italian regions, farmers in Marche are known for overseeing their crops with a little help from lunar methods (think the Farmer’s Almanac). Legends handed down from generation to generation continue to play a significant role in when work gets done on farms throughout the region—including when their delectable casciotta d’urbino cheeses are produced. Marche has staked its claim as the origin of porchetta, a boneless pork roast stuffed with herbs and spices and roasted on a spit. This savory and fatty dish is held in very high regard through Italy. So much so, the Italian Ministry of Agricultural, Food, and Forestry named porchetta a prodotto agroalimentare tradizionale, a traditional food product of great cultural significance. Marche is also a region where you’ll find delicious pasta, especially in the coastal city of Ancona. Wide noodles such as lasagna and pappardelle are preferred here, and you must try the region’s signature dish, vincisgrassi. This pasta casserole is highlighted by a rich meat ragù and a creamy bechamel sauce. If you ask us, any chance to sample authentic vincisgrassi makes a trip to oft-overlooked Marche essential. The heel of Italy’s boot, Puglia is not to be walked away from when it comes to food culture. For many, Puglia is their first stop on any culinary tour. Considering we’re in Italy, that’s saying a lot. But there’s no denying just how special this agricultural haven is—especially when you sink your teeth into their fresh fruits and vegetables for the very first time. They’re so flavorful, they transform antipasto from an appetizer to a full-blown meal—you simply won’t be able to help yourself from going back for seconds (and maybe even thirds). Orecchiette is the pasta of choice here, which translates into “little ears.” A quick look at the shape of this pasta—made with just flour and water—should clear up any confusion on the name. Typically served with cime di rapa, or aged ricotta and fresh tomatoes, orecchiette is ideally shaped for soaking up and enjoying sauces (chefs were clearly “listening” to what their patrons wanted when they created orecchiette). Puglia is also where much of Italy’s olive oil is produced, which you can sample for yourself on our ancient tradition of olive oil shore excursion. You may even want to bring some home with you to add an authentic Italian flavor to your next meal. Home to Rome, Lazio truly was once the center of the known universe. Many of Italy’s most famous pasta dishes—including spaghetti carbonara, cacio e pepe, and pasta alla gricia—originated here, and in general, the region prefers long strand noodles (think the aforementioned spaghetti and fettuccine). During your time here, you can join us for an authentic pasta making workshop at a local farmhouse, where you’re certain to pick up a secret or two from local paste producers. A trip to Lazio isn’t complete without sampling saltimbocca—one of the area’s most iconic meat dishes. Imitated around the world, authentic saltimbocca is highlighted by veal that is wrapped in thinly sliced pieces of prosciutto, then pan-fried in white wine and butter. You’ll also want to try an order of Arrabbiata—a traditional pasta dish notable for its particularly spicy tomato sauce. You’ll find more chicken-based dishes in Lazio than in most other regions of Italy, which makes it the perfect place to try pollo con i peperoni. Commonly associated with Ferragosto, a holiday celebrating the Assumption of the Virgin Mary, pollo con i peperoni has become a much loved warm-weather dish consisting of seasoned chicken and a colorful mixture of bell peppers. Artichokes are also integral to cuisine in Lazio (especially when deep-fried whole in a dish known as carciofi alla giudia), as are sizable green olives, which are used in the production of canino dop extra virgin olive oil (try some as seasoning on your bruschetta). This is also the home of pecorino romano, a hard cheese made using sheep’s milk and often served over pasta dishes. Like Sardinia, Sicilian food has been inspired by cultures that have carved out their spot on the island over the centuries. It’s not uncommon to find Greek, Arabic, and Spanish influences in dishes served here—and Sicilians take pride in blending these elements into something that is distinctly their own. As a region, Sicilia is amazingly fertile, and the variety of crops that can grow here (everything from oranges to eggplants, tomatoes to pistachios) is nearly unparalleled. Combine this with a wealth of seafood found just off the coast, and you have the recipe for a fantastic gastronomy scene. Order sfincione in Sicilia and you might expect a hot slice of pizza, but you’ll be in for a surprise. Instead of a traditional pizza pie, expect a rectangular, thick, and doughy crust—actually quite similar to focaccia. As for toppings, you’ll find the traditional tomatoes, onions, anchovies, and herbs for seasoning, as well as strong local cheese—often caciocavallo, a stretched-out curd cheese made of goat’s milk. This will all be covered by the sauce, which goes on top to ensure it doesn’t soak into the thick crust. To get a sense of Sicilian snacks, make a point of trying arancini. These fried risotto croquettes are a sought-after street food that, while easy to find, prove difficult to replicate (if only because every vendor puts their own spin on them). Some arancini are stuffed with meat ragù, others may contain mozzarella cheese and peas. Try a few while exploring a Sicilian market and you won’t be disappointed. Just make sure you leave room for cannoli—the signature deep-fried pastry tube of Sicilia! If you’re still hungry—and a little adventurous—treat yourself to the crunch of a few raw red prawns. Often served in elite restaurants around Italy, Sicilians know the secret to a tasty prawn is a splash of lemon juice and a drop of olive oil. That’s it, no need for cooking. If you consider yourself to be a serious foodie, your stop in Sicilia isn’t complete without trying this tasty—albeit unconventional—snack. Perhaps Italy’s most renowned food region, Tuscany’s reputation is well earned. Hearty, simple, and seasonal, a trip through Tuscany is like a trip through Italy’s culinary heart. You’ll quickly notice almost all meals in Tuscany are served with a simple loaf of unsalted bread. This tradition dates back to the 16th century when a tax placed on salt forced local bakers to get creative with their baking. The salt tax is long gone, but the tradition has carried on and in many ways is the signature element of Tuscan bread. Initially, this bread may seem a little flavorless, but you’re missing its main purpose—to soak up leftover sauce and juices on your plate after the meal is done. Keep this tip as fresh in your mind as the bread in your basket and you’re in for a delightful meal. Bread shows up throughout Tuscan meals, from fettunta (a traditional bruschetta) to ribolita (a twice boiled soup). You’ll even find bread salad, better known as panzanella, which is day-old bread mixed with a medley of sun-ripened vegetables, drizzled with olive oil and vinegar. But it’s not all bread in Tuscany! Pasta is also (unsurprisingly) popular, particularly pappardelle alla lepre, which is an egg noodle dish served in a wild hare sauce. For many, this is the signature Tuscan meal. Other enjoyed meat dishes include cinghiale in umido (a wild boar stew) and bistecca alla Fiorentina—a Tuscan steak that comes from the Chianina breed of cow. And speaking of cow, don’t miss the chance to try lampredotto—the fourth stomach of a cow. Now hear us out, this may seem like a strange choice, but locals love it, and you’ll often find them queued up on the street waiting for a serving. You’re on vacation, now’s the time to eat adventurously! Nestled between the mountains and the sea in Northwest Italy, Liguria is synonymous with the Italian Riviera. And being a coastal region, it also has a close association with fresh seafood, particularly fish, mussels, and squid—all of which is often combined in ciuppin. A soup originally conceived as a way to use up what was left at the end of the day at the fish market, ciuppin offers a beautiful hodgepodge of flavors. Because fish is more common the meat in Liguria, you’ll also find fresh seafood in most pasta dishes. You can even order antipasti ai frutti di mare, which is essentially a charcuterie board from under the sea. If you’re craving seafood (alongside a view you simply must see), we recommend booking a terrace table at Ristorante Belforte, where the carefully curated menu is certain to tantalize your taste buds. Located about an hour northwest of Portovenere, the view alone is worth the trip. Pesto is also a prized ingredient in Liguria cooking, in fact, you can trace its origin back to Genoa, the region’s capital city. If you’re looking for tips on making your own perfect pesto, you’re in the right place, as you can make your own when you join us for an authentic cooking class in the seaside villages of Cinque Terre. The northern region of Emilia-Romagna is sometimes referred to as “Italy’s breadbasket” for its robust gastronomy scene. This is a region to visit if your heart is set on eating well, and eating a lot. Balsamic vinegar and parmigiano reggiano (known as parmesan around the world) were born here, as were favorites like prosciutto di parma and cappellacci pasta. One thing you won’t find, however, is spaghetti bolognese. This may seem strange, considering Bologna is the region’s capital. So why the name? It probably comes down to a miscommunication after WWII, when American soldiers returned home hoping to find something as delicious as the ragù they ate on deployment. When they asked Italian immigrant chefs to replicate it, something obviously was lost in translation. Spaghetti bolognese was born, but don’t bother looking for it on the menu in Emilia-Romagna. Instead, sample the many unbelievable ragù-topped dishes waiting for you. While it’s arrivederci for spaghetti bolognese, you will find plenty of tortellini, as well as two different types of gnocchi: pisarei e faśö, which is made from flour and breadcrumbs, and borgotaro malfatti, which is made using ricotta and herbs bound together by eggs and breadcrumbs. When we visit, we never miss a chance to try erbazzone, the region’s iconic savory country-style tart stuffed with spinach, chard, parmesan cheese, and pancetta. Bordered by Austria to the north and Slovenia to the east, it should come as little surprise that the culinary traditions of Friuli-Venezia Giulia are influenced by its European neighbors. Dig a little deeper, and you’ll discover that everyone from Napoleon to Attila the Hun has passed through the region on their way to the Adriatic—bringing with them recipes and spices that locals have absorbed and incorporated over the centuries. Polenta is popular here, and it is often served with stewed meats, or fried flat with cheese and potatoes into wafers known as frico. When you visit Trieste, stop by Tavernetta al Molo for polenta with fish (and enjoy the lovely sea view while you dine). In the western parts of the region, cheeses such as montasio and frico are favored, as are smoked meat meatballs known as pitina. To the east, the neighborly influence really comes into play, and it’s not uncommon to dine on goulash, apple strudel, and jota—a stew comprised of beans, sauerkraut, potatoes, bacon, and spare ribs. This is where you can also try cherry gnocchi. This dish is served during cherry season, which occurs in the summer. As the seasons change, you can expect to see less cherry gnocchi on the menu, but more plum gnocchi—a dish again inspired by the neighbors to the north. Eager to learn more about the food emerging from Friuli-Venezia Giulia? Take a cooking class at EATALY Trieste, where your chef-instructor will guide you through the creation of an authentic Friuli-Venezia Giulia meal. From the mountains down to the shores of the Adriatic, Veneto is a region steeped in dramatic shifts. That goes for more than just the landscape, the food also varies greatly—both from Italy as a whole and even within the seven provinces that make up the region. It may surprise you that pasta doesn’t play a significant role in Venetian cuisine. Certainly it’s not unheard of to find a restaurant serving a bigoli dish, but here in the north, polenta and rice have usurped it as the carbohydrates of choice. If you’re a foodie, the risotto you’ll try in Veneto is as awe-inspiring as the gondolas navigating the canals of Venice, the region’s capital city. On the shores of the Adriatic, seafood risotto is common, but the further inland you travel, you’ll find plenty of variations—including pumpkin, radicchio, and even frog legs. While debate has raged for many years over where tiramisu was invented, the consensus is that it's a Venetian dessert. Even if this weren’t the case, we’d still recommend a visit to I Tre Mercanti to try what many locals and visitors alike consider to be the best tiramisu in the city—which makes a good case for it being the best tiramisu in the world. A common Italian toast before a meal, cento anni is a wish for one hundred years of health, and we could easily spend that amount of time discussing Italian fare, but we’d much rather be sampling risotto in Venice, ordering pappardelle alla lepre in Portoferraio, and investigating the finer points of Neapolitan pizza along the Amalfi coast. Will you be joining us? Sample our upcoming cruises to Italy today, and prepare yourself for the feast of a lifetime.